The Pantone color of year for 2018 is Ultraviolet. I’ve made a start at a series that will be added to throughout the year. The largest in the foreground is the newest and I’ve kept it more dominant in the colorway. It will be fun to see where the color takes me. It ”feels” different working this color. With Temari the ball is more or less in my face for the duration of the ball, so seeing the color is easy. To me the pallet is blue, violet, red. All those ingredients make the base. I do follow design directions of course, then again I don’t. For the big ultraviolet ball I wanted to try a structural marking I had never done before, something called S4–with extra guidelines. It makes a marking on the surface of 6 squares and 8 hexagons, all with equal length sides. It was quite easy to set the grid. In emphasizing the 4-6 combinations I kept to that beginning with the 1st layer of forms. The 2nd separate layer connects the centers of the 14 shapes using interwoven bands of color. To my eye it worked very nicely, both line and color. Something new for my tool kit. This design way is a new and inspiring field to play in. The 5 star is still central in this 2nd variation but the 6’s have changed quite a bit. Finding a pattern amongst all the structural lines has at times been confusing for me. All I can say with this one is that ‘I saw something’. A hint as to where to begin. I’m fairly new to this divine medium so being able to KNOW and or visualize ahead of the finished piece is not in my tool bag yet. Don’t get me wrong, I am in wonder at the results of accidental beauty and recognize that many hours and years of practical experience in color and needlework, other mediums and just simply the time in to learn are real ingredients of now. Oh yeah, 36.7cm. circum. Learning new skills and techniques has given me a needed boost in confidence in the Art of Temari. More complex, better ability to construct the marking, easier method of locating the 12 centers of the C10 starting mark. Adding all the extra guidelines and adjusting the many new centers so that they are all uniform and balanced around the sphere. These are huge improvements and they open up the medium to all that follows making the creating of new work in all design ways easier and clearer. Each of these attributes will show up in all new projects. The online tutorial, offered by Barbara Suess is a wonderful learning tool. Her guidance has been of great benefit several different times now, each addition of new skills and know how improves my work and provides deeper understanding into this art form. This ball is 43.5cm circum. Working with a colorway of lower contrast is of interest as well. I love the bold and bright high contrast vibrating colors but using a softer color progression pleases the eye and sense of rightness for me. I thought I had finished the ball last night, something was not quite right, but what. I went into the center of each 5 star center and added a small dark star and the result was just the needed detail. Learning these things along the way for all artists is common. It is for me in other mediums too. The willingness to look at the ‘thought to be finished’ piece and realizing ‘not quite yet’, perhaps not knowing what that last final touch will be can be the most important move. I guess that’s true about most everything when I think about it. Summer colors, late August through September, are bright but also a bit faded. Almost as if their pigment bank is nearing empty. Size range here is about 4” to 6” diameter. Simple divisions on into more complex. Weaving, layering by the thread pass, some new stitches learned in an online stitch-along through Temari Kai’s partner Talk Temari. 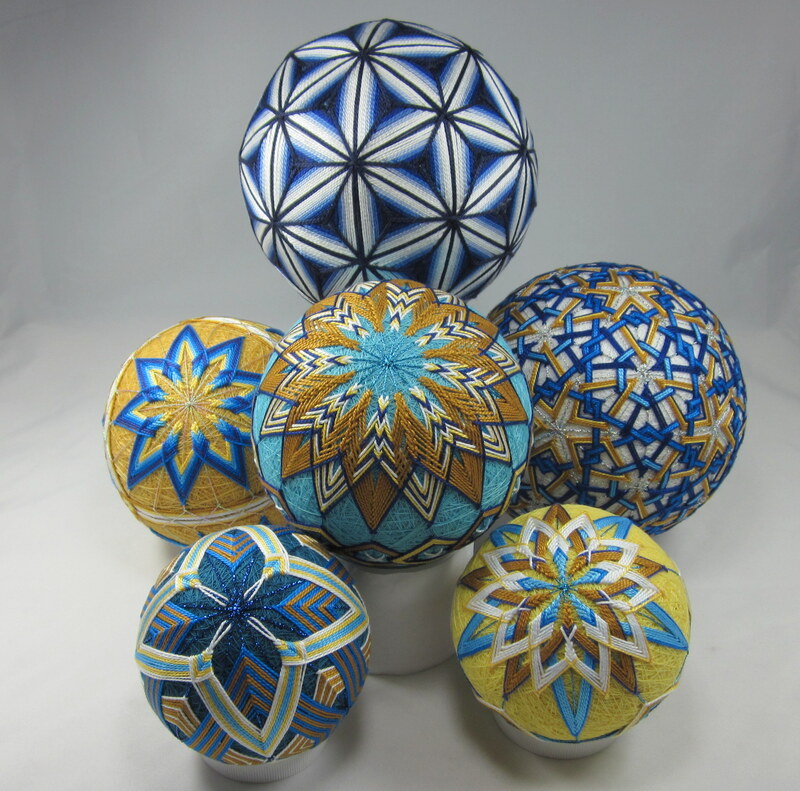 The movement of line and pattern when a group of spheres huddle together is a great visual tickle.